Investment Flash: Is the U.S. Dollar Going To Fall Off The Cliff? Financial markets trade on future expectations. At turning points, the majority of investors position themselves on the wrong side of the trade. Simply put, on each side of the trade it’s either money or numbers. We position ourselves with money and against numbers. For example, days after Hurricane Katrina had hit the U.S., the belief that crude oil could only go higher was widespread. 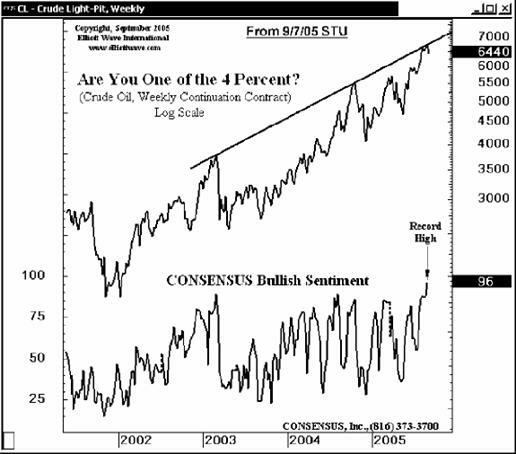 In fact, on Sept 7th, 2005 96% of advisors and analysts surveyed by CONSENSUS, Inc. were bullish on oil (chart below). Or simply put, big numbers were betting against big money. And what happened? The crude price subsequently fell 20%. Big money won. 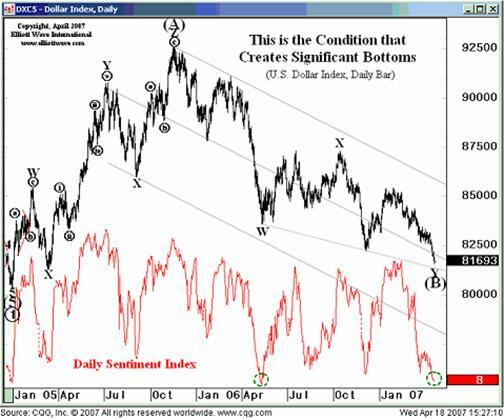 With pessimistic sentiment at a similar widespread extreme (92%) towards the U.S. dollar, it is highly probably that a turn is near. With a large percentage of investors positioned for a continued fall in the U.S. dollar, what is the wise way to be positioned? If you appreciate this type of contrarian analysis, our monthly Investment Analysis Report allows a more in-depth look at markets. Starting in July, our monthly investment analysis report will require a subscription fee of $40 a month. However current free readers may ‘reserve their seat’ via FeedBlitz for half price ($20 a month).